We Wish You A Blessed & Prosperous 2019! Now Min $25 (Before GST) For Free Island Wide Delivery! For Every $40 Spend Before GST. Promotion B: Spend $55 and above before GST and get your next (any) chicken dishes for 40% discount. T&C: Not Inclusive Of Delivery Set Menu. With more than 50 years worth of experience, Yeo Keng Nam Traditional Hainanese chicken rice is still an experience not to be missed! Dine in air conditioned comfort and enjoy our famous succulent Hainanese and furnace-roasted chicken rice made fresh every day. Our dishes follow a secret tradition recipe that will bring you back for more! Don't take our word for it, come and enjoy authentic chicken rice with your family and friends and judge for yourselves! “Where is the best Chicken Rice in Singapore?” Without a doubt, that would be Singaporeans most highly debated question. And because the debate seldom ends up as a mutual agreement due to individual preferences, we at Yeo Keng Nam would like to take the liberty to guide you on your debate by preparing a little tip to help identify great authentic chicken rice. Some argue it's the fragrant rice where as some will say it's the chili sauce. But we believe that the uniqueness of this delicacy is it's combination of all the 3 elements-extremely fragrant rice, fragrant stinging chili sauce and the succulent and tenderness of the chicken. Some argue it's the fragrant rice where as some will say it's the chili sauce. But we believe that the uniqueness of this delicacy is it's combination of all the 3 elements-extremely fragrant rice, fragrant stinging chili sauce and the succulent and tenderness of the chicken. The first mouthful of the rice should make you ask for more as the fragrance continues to spread easily within the mouth after each munch. This reaction is made possible because the aroma not only exists on the surface, but the fragrance had penetrated and has locked within each grain of the rice. And because the fragrant still retains after the first mouth, you can easily enjoy it further with our fragrant stinging chili sauce and tender steam or roasted chicken. The chili and ginger sauces complements and enhances that taste of the chicken rice. The sting, sourness and fragrant of the chili sauces would definitely make you ask for more. It will definitely be a favorite among spicy eaters as it gives the kind of sensation you would never find it anywhere! To ensure the chicken blend with the fragrant rice and chili, they have to be steam to the right tenderness to achieve the succulent quality that you would not stop sinking you teeth into them. The meat should look white and juicy instead of pinkish. And with the tips provided, we wish you all luck in debating realistically on “Where's the best chicken rice in Singapore?” with your friends, family and relatives in the future! Copyright © 2015 The Yang's Hainanese Chicken Rice. Copyright © 2014 The Yang's Hainanese Chicken Rice Pte Ltd. All Rights Reserved. The delivery is fast, the food still warm. Good!! I love roasted chicken and the salted egg pork rib the most. yum! yum! The white and roasted chicken skin is very juicy and fill of the nice fragrant. The chicken meat is also very tender. The chicken rice is very fragrant and quite tasty on its own. The chicken soup is very delicious. This place is nice for gathering with parents and friends. 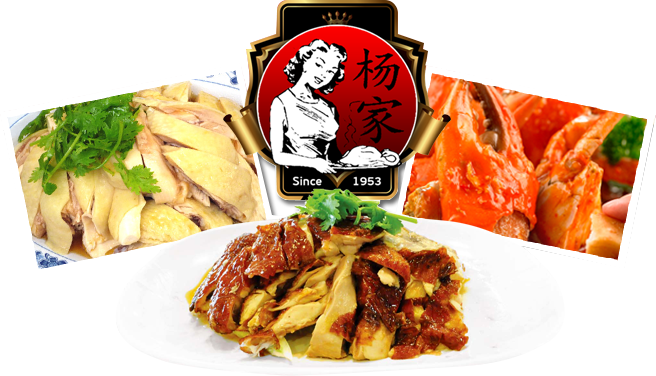 Many choice of dishes to choice such as salted egg pork rib king, spring onion sliced fish, french bean & etc. The rice is very aromatic and addictive.The taste of the food is great and generous portions. The food is nice and affordable. This shop sell other dishes beside the signature chicken such as salted egg pork rib king, cereal prawns, hainanese pork chop. These dishes very nice and delicious. The texture of pork ribs was just right and nicely coated with salted egg yolk, one of the better ones I ever tried. the best Chicken Rice in Singapore! it’s the combination of all the 3 elements-extremely fragrant rice, fragrant stinging chili sauce and the succulent and tenderness of the chicken that makes it the best! It's a hidden find around Little India area...the old school taste of traditional hainanese chicken rice! Other dishes we ordered are drunken prawns & Chinese spinach with assorted eggs. Taste great and generous portions. To end the meal with their only dessert .. organic soya bean curd. Was surprisingly nice, good way to end off a heavy meal. A hidden treasure in Serangoon road and of course, chicken rice is everywhere in Singapore but if you fancy a chicken rice thats econimical and if you happen to be around the area, try this one. I think their zichar is fantastic and the chicken rice was sensational! Best Chicken Rice that I would not give it a miss ! Good food, service & environment... a good place to gather with family ! A great place to enjoy good food with colleagues at The Yang's Hainanese Chicken Rice at affordable prices.